Linear motion products are the most commonly used motion elements in the automation of transfer, locating, and assembly machinery. Here, three types of linear guides, Linear Bushing, Slide Guide, and Oil Free Bushing will be compared and explained. The characteristics of the three types of linear motion products are shown in the table below. It is important to first understand the differences in performance based on the load capacity of the component. A machine using Linear Bushings or Oil Free Bushings, which moves on a shaft where both-ends are supporting a heavy load, can elastically deform the Shaft. (See Photo 1). Another important factor to consider is the difference in performance related to the coefficient of friction. In Linear Bushing and Linear Oil Free Bushings utilize two surfaces sliding against each other, which result in higher friction. *Note – The value of friction coefficient can influence the capacity of an actuator and heat generation during movement. Oil Free Bushings are inappropriate because of heat dissipated by continuous high-speed operation. In the case of using Air Cylinders, speed control of the start / stop is not possible. Mechanisms such as Shock Absorption Dampers need to be set to stop the speed softly. It can shorten the cycle time. The next factor to consider is that of guide accuracy when the performance depends on the clearance of bearing and rail/shaft. In some instances, shafts are used for the rail with a Linear Bushing. The fit between Shafts and bushing is clearance fit (when g6 tolerance Shaft is used we have normal clearance, when h5 tolerance Shaft is used we have smaller clearance fit). Another application might use a Linear Guide as the profile rail (or track rail) and bearing block (or slide unit). Fit ranges from 0-3µm for Clearance Fit types to -3-0 µm for Preload types. An Oil Free Bushing is used with a Shaft, where the clearance is larger than a Linear Bushing therefore guide precision is lower. Finally, consider environmental conditions and ease of maintenance. The performance difference depends on the materials used. Linear Bushings and Linear Slide Guides maintain long term reliability with the use of lubricating grease. Therefore, they are not applicable to be used in an environment that exceeds the environmental specs the grease. Oil Free Bushings provide higher performance because they do not require the use of lubricating grease. Straight (Photo 1) and flanged bushings (Photo 2) share a similar structural design. The main advantage of using flanged Linear Bushing lies in its compact design (Figure 1) as the integrated structure saves space. The outer cylinder flange allows direct mounting of the bushing and allows flanged bushings to maintain higher load capacity than standard Linear Bushings. A hardened, precision flanged outer cylinder (housing), made out of chrome steel or corrosion resistant steel, is advanced in its quality, and lower in cost compared to “self-made” flanged housing. 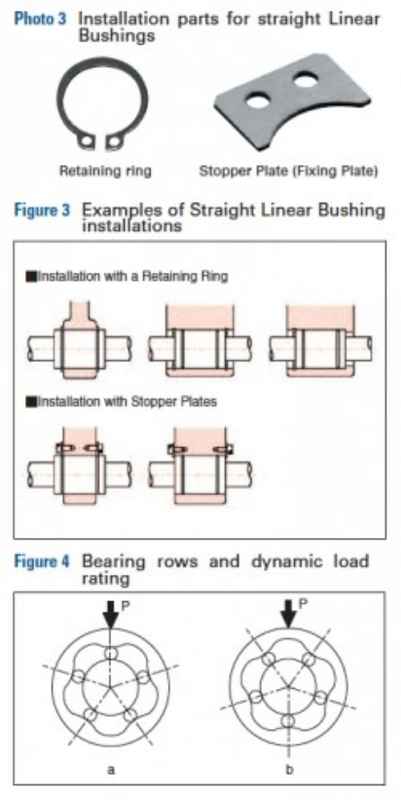 The following factors should be considered when making Linear Bushing selections. Decide whether force will be applied to the Linear Bushing. Choose a flanged type if the Linear Bushing must bear force. The Linear Bushing in the component a) receives inertia force from the moving component, therefore the Linear Bushing must be firmly screwed to the housing. As for component b), an Air Cylinder moves the Shaft in the Linear Bushing. The Retaining Ring fixing the Linear Bushing only receives the frictional force from the Shaft. Therefore, a compact design using a straight type is fine. The same can be said for c). As shown in Figure 2, depending on the design, Linear Bushings can either move while Shafts are fixed, or be stationary (fixed) while Shafts are in motion. X-axis: If the Linear Bushing moves, use the Flanged type bushings. Y & Z-axis: For fixed Linear Bushing, use Straight type with Retaining Ring or Stopper Plate. *Notes on installation angle: Load rating of Linear Bushing varies according to the load position on the circumference. Linear Bushing, usually has 4-6 rows/ball tracks that are set on even angle. 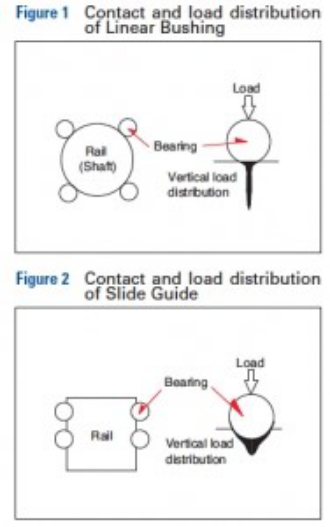 When installing, if possible, avoid positioning Linear Bushing so that the ball track is under direct load (Figure 4), otherwise that row will directly bear the load (Figure 4a). right figure ÷ left figure. Therefore, angle load should be installed as in the right picture. For further examples of linear bushings, check out these application examples from our application Library called inCAD library. 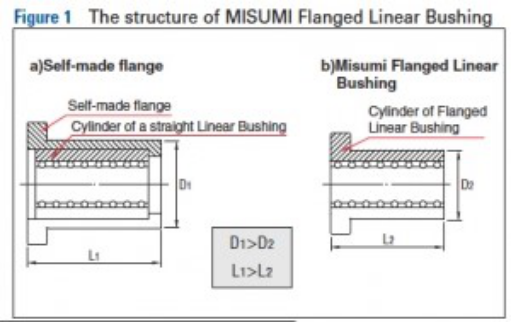 If you have any further questions, please contact our engineering support team at engineering@misumiusa.com.